Our onsite design and tooling capabilities mean we can produce Hydrophilic TPE’s profiles specific to your requirements. 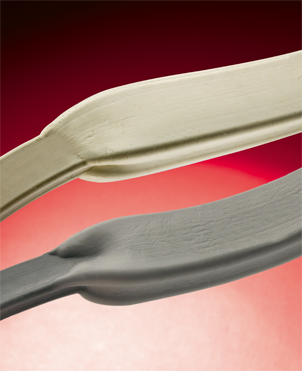 These profiles can be used to form a sealing solution for use within water retaining and water excluding applications. Reddiplex Hydrophilic profiles are the ideal solution for pipe work, water treatment facilities, containment structures and much more. When the Hydrophilic TPE’s comes into contact with an aqueous liquid with a PH value between PH7-12 the polymer particles swell to form a water tight seal preventing the passage of liquid. The Reddiplex TPE’s have particles in the 500-1000mm size range meaning they are evenly distributed within the base polymers producing a controlled and integral expansion. OUR EXPERTISE IN MATERIAL AND PROCESS SELECTION MEANS THAT YOU RECEIVE A HIGH PERFORMANCE SOLUTION WITH THE EXACT FUNCTIONALITY YOU REQUIRE. Hydrophilic TPS’s are suitable for use in pre-cast and in-situ applications as the material does not need to be completely encapsulated to ensure a watertight seal. 100% reliable performance, which will not disintegrate under wet dry cycles. Holds formation preventing the ejection of particles forming a fragile matrix, improving mechanical strength.